When I lived in Arizona, we practically lived on candy made from Prickly Pear. It was everywhere. I didn’t have to make it, because it was readily available in every store within walking distance and beyond. I loved my time in Arizona for so many reasons, and I long to move back there some day. It probably won’t happen. But a girl can dream. And in the mean time, I made Prickly Pear Gum Drops. 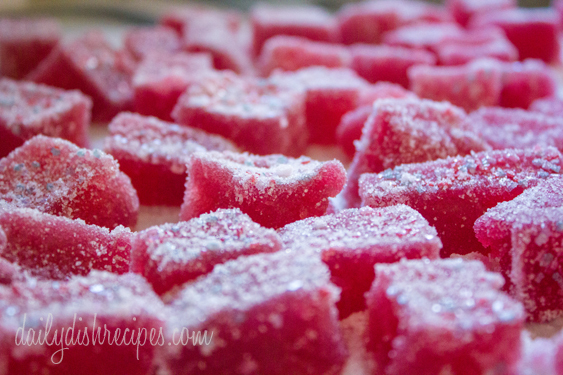 Did you see these fun Prickly Pear Gum Drops made from Cactus Fruit? In the meantime, I can at least give myself a little taste of Arizona via some homemade Prickly Pear Gum Drops. I’ll be totally honest, I was not convinced this was going to work. We make fruit gum drops all the time, but this is prickly pear fruit (cactus fruit) which for whatever reason, is just different than regular fruit and different to work with. But guess what? It totally worked. It’s great! Just a note: I am in Missouri. St. Louis to be exact, and both of our local chain grocery stores carry Cactus Fruit/Prickly Pear fruit. It seems to be slightly seasonal appearing mostly in the spring/summer months. It’s in a really small section by itself, but you might consider asking your produce manager if they ever get it in. It was super easy to find for me, but since then some are saying they can’t find it at all. Update June 2013: I asked our local Schnucks produce manager about the cactus fruit and he said they get what they get. They get a very small amount and sometimes it goes really fast, and other times it lasts for a bit. Find out when your local store gets their shipments in and that might help. Spray an 8 x 8 glass baking dish with nonstick cooking spray. Then set it aside. In a large saucepan, combine the pureed and de-seeded prickly pear cactus fruit with the applesauce. Whisk the pectin and a 1/2 cup sugar together in a small bowl. Once mixed well, add to the cactus fruit. Clip a candy thermometer onto the side of your saucepan and bring your mixture to a boil. Whisk in the remaining 2 cups of sugar. Pour the hot mixture into your 8x8 prepared glass dish. When slightly cool (about an hour), sprinkle sugar on top. Once the candy is mostly set, enough to cut, cut your mixture into 1-inch squares, or use a mini cookie cutter sprayed with non-stick cooking spray to make hearts, flowers, whatever - though if you plan to use anything other than just a sharp knife, you might need to let them dry even longer, though they will dry better when cut. Dredge in some sugar and allow to dry another 6+ hours or overnight on a piece of parchment paper. Store covered for up to two weeks. Have you ever used a unique ingredient to create candy? Get more great candy recipes. Thank you Starla! They taste really good too! Hi Jackie, I’m so sorry this didn’t firm up for you. I haven’t tried it with 2 cups of juice, and I know canning is a bit of a science, so I wonder if it’s the exact measurements that matter. I’m wondering if using a bit more pectin would at all help. I seriously need to make these gum drops for my kids…but where do I find the cactus fruit? Or can I substitute any fruit??? Jocelyn, I’m pretty sure you can use any fruit with the recipe, however don’t think you can’t necessarily find it. Oh my goodness I need these in my life. I love prickly pear and miss having access to it. Laura, it’s amazing, isn’t it? They were super easy and such a fun treat! They are just so good! Totally different flavor than anything else. I was so excited to find a recipe I could use for the impulse buy prickly pears. I followed the recipe to the “T.” Now 4 hours later I have “gumdrops” that set up on top, but are still semi-liquid when I try to take them out of the Pyrex. What went wrong? 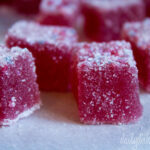 Other gumdrop recipes I’ve seen use pectin an gelatin or just gelatin. Was that supposed to be in this recipe as well???? No. I made the recipe exactly as is. Your humidity level (both inside and outside) can affect how quickly it dries. For me, I was making those in February so the air was very “winter” dry. It only took a little over 2 hours for them to dry. Having made other types of gum drop candies, I have waited up to 6+ hours. When I made those I did let them dry overnight, because I was going to bed. There was supposed to be a + that was inadvertently left out of the recipe after the two… indicating 2+ hours. In other words, depending on climate it can take anywhere from 2 hours to whatever. Let them set at least overnight (6 hours or so) and then attempt to cut them again. Mine were VERY sticky when I cut them, which you want because the sugar adheres well. Then you allow them to dry again, 6+ hours after adding the sugar. I hope this helps. We loved ours so much and I hope you can enjoy them too. These sound PERFECT. I live out in Tucson AZ and we’re in the middle of a particularly robust prickly pear fruit harvest season right now– they’re everywhere, deep burgundy and fully ripe. I’ve tried a few other recipes but never found one I was fully happy with, but this sounds absolutely great. One question– have you ever made this in silicon rubber molds? I have some flower and heart ones about half an inch deep that’d be really lovely; do you think they’d work okay? And thank you for the recipe! Hi Suzanne, I hope I can help with this. I have not used a silicone mold. Do I think it would work? I have no idea, but I am not convinced it would with this recipe. It’s extremely sticky until it dries out and I am wondering if it wouldn’t get stuck in crevices etc. With that said, I can’t say for sure it wouldn’t work, so if you decide to try it, do let us know how it goes. The drying time is the hardest part of the whole thing, because you just want to eat them so badly. Your drier air should help, as those of us in high humidity conditions have it rough (can take days to dry out enough). Please let me know how you like them if you decide to make them. Thanks so much for the reply! Sadly, right now all is NOT dry in Tucson– we’re in the middle of Monsoon Season. Since at one point you lived in AZ you probably know what this means; for everybody else, it means that this is the time of year that we get rain! It usually rains at least 3 out of 5 days, mostly brief thunderstorms but not always– I woke up to steady rain this morning. So I may be doing some of my drying in a warm oven… oh well. Without the rain, we wouldn’t survive; that’s the desert for you. Also, I think I’ll stick to the regular molding method rather than use the molds. Just a thought on drying them out, if you have a “no frost” refrigerator this dries out anything, I dry herbs in mine, I just leave them in the bottom of the fridge on a polystyrene tray and they dry out faster than hung up in the kitchen, works a treat, no reason why it shouldn’t dry out the sweets I’m thinking? My family & I are now juicing the near 100 lbs. of Prickly Pears that we picked over the weekend. I found this recipe & am anxious to try it! We make loads of jelly every year & share as Christmas gifts 😉 Anyways, I was wondering if I can use the juice for this recipe or if I need to set aside some to peel & puree separately to use? Also, have you used the fruit after it’s been frozen for this recipe? If so, how does it turn out? If it turns out well, I’m thinking of adding it to our Prickly Pear gift basket we make for our family at Christmas time! Thank you! Hi Valerie, I’m glad you’d like to try it. I really can’t answer the questions about freezing the fruit and then using it, because I have never done that. We get the fruit so rarely up here and they get such a small amount at a time, that I just grab what I can and make something with it each time. The candy might last that long if frozen though, again I don’t know. It’s a sticky candy so I’m not sure how any of that would work. Also about the juice, what you read here in the directions is what I have tried and had work. I haven’t done a lot of experimenting since this worked I was happy with the results. If you decide to try any of the things you’ve mentioned, please do come back here and let us know the results. Just be sure to give the candy plenty of time to dry after you make it. Good luck! Hope you enjoy it! I tried this, love the favor but after 8 hrs mine are still sticky. I can’t wait for them to set up! Did they firm up for you? I left mine overnight which wound up being about 10 hours I think, and then of course cut them. THey were still slightly sticky when I put the sugar on them and allowed them to dry. The candy’s take about 2 days to really complete and be less sticky, I think. Well hello there neighbor. You’re pretty darn close actually. I will be out in your neck of the woods tomorrow night actually at Otis Campbell’s with my friends band. Love your area so much. Also a little jealous of your recent trip to AZ. Formerly home for us. Schnucks has Prickly Pears about 3-4 times a year for a few weeks at a time, so hopefully you will find some! I hadn’t thought about JI possibly having them. I might need to check that out. I’m so glad you stopped by and found me! Schnucks ordered them for me – just picked up 9 pounds tonight! On this recipe, is it pure powdered pectin, or pectin like a pack of Sure-jel? Also, when do you add the pectin/sugar mixture? Hi Ruth, I’m so glad Schnucks was willing to order them for you. I haven’t seen them in a bit (recipe is older) but have been craving them. I have updated the recipe with the answers to your question. Yes, Sure-Jell and pectin/sugar gets poured into cactus mixture as soon as its heated and stirred. Hope you can help. Didn’t use a thermometer so boiled everything a little longer than 5 minutes. Doubled recipe and used one glass pan that was larger than 8 X 8 and a smaller metal pan for the rest. It’s been about 18 hours and neither is gelled enough to cut. I have them covered with a paper towel. Should I keep waiting, or will I need to return it to a pot and bring it to another boil? Hope to hear from you. Thanks for the recipe. Got some fancy papers, and tubs to put them in when finished–a gift from AZ to send to my granddaughter when she starts college in Philadelphia, PA soon. I am so sorry that I missed your comment. By now, I am sure the whole thing is either a win or a loss. I am not sure I would have been much help. When I create my recipes, I try to offer the exact instructions of what I did so that the recipe turns out perfect for others. Using a thermometer I believe is an important part of making any kind of candy, so you don’t under or over boil, which changes the results many times. I also wouldn’t have recommended doubling the recipe for the simple reason that the drying process was a specific size and you may have wound up with more in a pan that was originally intended. I am curious how your results were at the end? Again, I am so sorry that I didn’t see this comment until now. Hi! Thanks so much for this recipe. I have some gumdrops cooling right now. Because of my altitude (8000 ft), it took quite awhile (45 min) to get to 225 degrees, but we stuck it out! Did the gumdrops in your pictures really turn out that color with only 1/2 cup of prickly pear juice? My juice is that color, but after mixing it with the applesauce, it turned out a rich amber. I wondered if maybe I should put in more juice next time. How do these taste? I was very excited to find this but for some reason reading the apple sauce on the ingredient list kinda made myself turn over in my future grave. Does it taste like apples or taste like the cactus fruit? Cactus fruit is very strong and has a very unique flavor. It tastes like Cactus Fruit not applesauce. 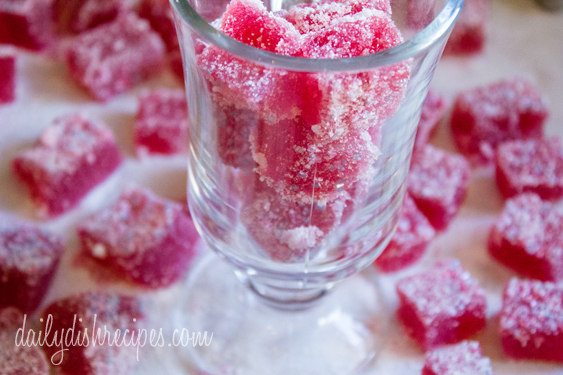 I”m making this recipe for party favors, but prickly pear is out of season. I found some prickly pear puree on line, but it was sweetened with sugar. When I made the recipe, I omitted 1 cup of sugar to compensate for the already sweetened puree. They taste divine and look very pretty, but are not gummy like gum drops and after leaving them out to dry for 2+ days figure they won’t get any more solid. Any suggestions? And will the end product be impacted if I double the recipe? Can I put alcohol in them? I suppose you could try, but I’d definitely assume the texture, drying time and other components would change quite a bit. If you do decide to try it, please let us know how they turn out. Good luck! I had not thought of trying a J store for nopal & tuna! I’ll give it a try. I live in S St Louis, and J stores are everywhere. However, last week I stopped at El Torito (Cherokee & California) and they had bins of tuna, both red & green, as well as nopal pads. I plan to also try Carnicería Latinoamericana, since they have a branch on Grand, much closer than Cherokee. My Dad used to talk about prickly pears and how cattle people would remove the thorns with fires so cattle could eat them safely; naturally my first impulse now is to flame them. The produce department does not clean them as well as Schnucks’s supplier; there were thorns loose in the produce bag when I got it home. The grocer provides tongs. Use them.